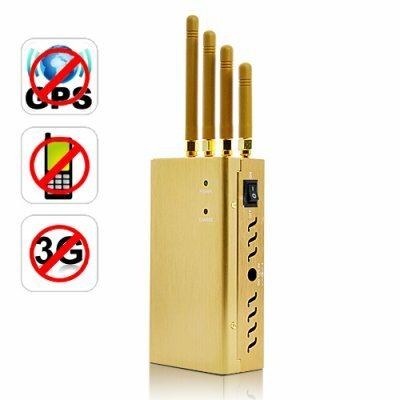 Successfully Added High Power Signal Jammer for GPS, Cell Phone, 3G (Extreme Cool Edition) to your Shopping Cart. High Power Portable Signal Jammer - a powerful and portable solution for completely blocking nearby cell phones including 3G signals, and GPS signals. Usable worldwide. Powerful and effective, this portable signal jammer effectively disables any 3G networks, GPS devices, and cell phone signals (on the GSM, CDMA, DCS and PHS bands) without interrupting any other electronic devices. The highly portable size and one-touch power button allows users to quickly turn the device on or off for instant jamming and unjamming. Incredibly easy to operate and carry around, this portable signal jammer is both the ideal security and anti-security device and quite simply one of the best we have ever tested. With this HIGH POWER Portable Signal Jammer, you get a TRUE working radius of up to 20 meters, meaning this portable signal jammer can be used to cover a large area without hassle. So how does it work? Just turn it on when conducting your company presentation, meeting, worship service, legal proceedings, or other important activities, and you will instantly have complete security and a disturbance-free environment. Sick of being tracked like a criminal? Turn this portable signal jammer on to block all GPS signals and go where you want without worrying about being tracked by any GPS devices that might have been installed by your wife or boss (or both!). When turned on, you get instant jamming and when you turn it off, all GPS devices and other network activity will automatically be re-established again. I think my country does not have any specific laws against these devices, but I am still afraid that customs might seize the product. Can you list it on the packing label as a "Wireless Signal Measuring Tool" or something like that? Talk to our CS Team before you place your order. We may be able to assist you, but the potential customs or tax liabilities for the package is still completely your responsibility.